The WORK Magazine Issue No. IV ” Manipulation” is almost ready for your bedroom eyes, and we couldn’t be more excited to give you fuel for your pleasure. Expect a sneaky peek here and there, as we test your patience and strong will. 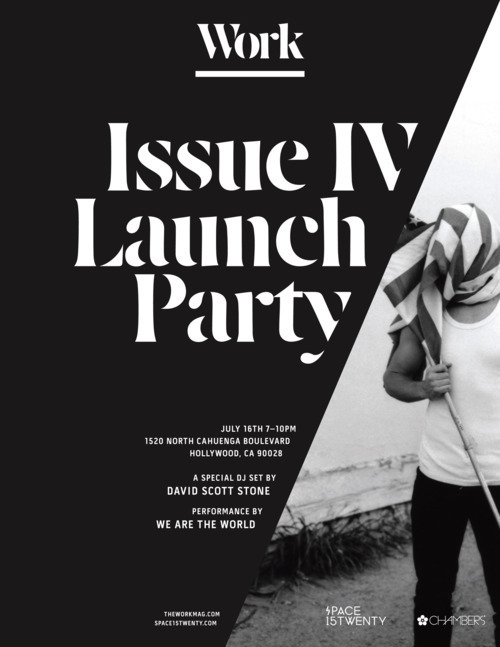 Our Launch PARTY will be one to not miss. I never lie, at least I try hard not to. We’ve got our incredible friends David Scott Stone doing a special DJ set and performers We Are The World that will take you from musical performance to performance art. Both art sets will coincide with the issues concept of manipulation. We could not thank Space 15 Twentyand Chambers Clothingenough for their help in making this happen. Celebrate with us on July 16th and expect to experience something very different.